Golden Associates announces the installation of solar panels to their Design Studio. This is your personal invitation to attend a mini-retreat, among your friends at the OWA. We appreciate what you have contributed to the organization over the years, and would like your feedback on the future of the organization. Come and enjoy this gregarious event in the beautiful surroundings of a California native garden in Lafayette. This is a change of venue from our previous announcement in Berkeley, because there was a mix-up at the venue. 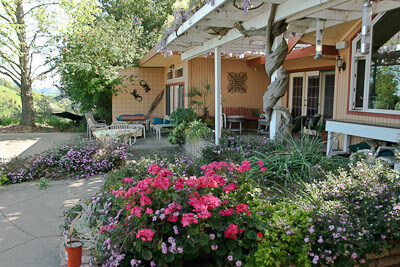 Our steering committee member, landscape architect Leslie Golden, has offered her home and gardens for our retreat. OWA’s Visioning Retreat promises engaging conversations and gourmet delights. This is the opportunity that you have been waiting for, to define the future of OWA and ensure the original mission and goals remain intact. What a better time to revisit this discussion, as we prepare for OWA’s 40th anniversary? 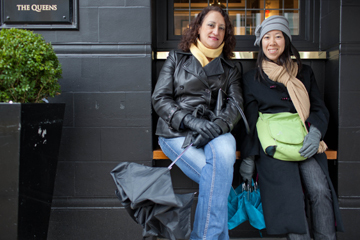 OWA has served us for many years, as a support network for women in design professions. What challenges do we face today and how should we meet them? Please RSVP by April 20 to Joanne Winship and she will provide additional information to you. Lunch and the venue will be provided at no cost to members who RSVP on time. You are also encouraged to send in your thoughts about important issues to cover as we prepare the day's agenda. Thanks for your continued support of OWA and women design professionals! Jean Hansen, FIIDA, CID, LEED AP will make a presentation on Healthy Alternatives for Interior Finishes and Materials. The presentation will give AIA and GBCI continuing education credits. As we strive to design & create healthier, more sustainable interior environments, our work needs to include thoughtful selection of materials, finishes, furniture and fabric. In examining the materials, components and chemicals used in manufacturing of the products we specify, it is critical to consider how these details affect not just the health of the occupants, but also the health of surrounding communities and the environment. A growing number of manufacturers are making significant strides toward reducing the environmental and health impacts of their products and are on the road to a continual process of improvement. In addition to information shared on chemicals of concern and their health effects, the transitional and safer chemicals, new materials and finishes in the market-place will be shared with the audience. Time to get involved! We have a great group on the Steering Committee but we need more people to help achieve our goals. Anyone interested in helping to shape the direction of the Organization of Women Architects and Design Professionals is urged to provide one paragraph bio, photo and a short statement of why you want to be on the Steering Committee by August 30th to be included in the September Newsletter. Elections will be held at the Oct 19th General Meeting. Any newsletter announcements or articles should be submitted by August 30th as well. As part of our effort to increase the support that OWA offers women design professionals, the steering committee would like to establish a scholarship committee. This year we voted to donate money to the ACE scholarship program, which will benefit a female student who has been accepted to a design school in a four-year college. Next year, however, we hope to administer our own scholarship program and we invite you to participate! Instituting an OWA scholarship committee would enable us to personally select the candidate and stay in contact with her throughout her school experience. It would also allow us to establish more specific criteria for applicants. The scholarship committee will be responsible soliciting applicants, announcing the scholarship award on a number of local financial aid databases, establishing the application requirements, reviewing the applications submitted, selecting the award recipient, and finally acknowledging this recipient at the annual retreat. In addition, funding the scholarships may involve some fundraising efforts. We appreciate your feedback on the scholarship program. If you would like to serve on the scholarship committee, please contact Karlene Gullone. Take a look at the AWA-LA scholarship program to see a similar example. The second anniversary of online publication the Green Architecture and Building Report, also known as the GAB Report, is coming up this April. Long time OWA member Mignon O’Young is the founder and launched it on the day of OWA’s Reception and Exhibition during the 2009 AIA National Convention in San Francisco, California. The Green Architecture and Building Report (http://www.gabreport.com/) is a resource for sharing and exchanging information on responsible, green, and sustainable design, ranging from the architecture to the building details, and from site features to products. It covers commercial and residential projects, building materials, carbon neutral (net zero), GreenPoint, LEED, interior design, landscape architecture, and sustainable urban planning. Sharing lessons-learned and practical experiences is a great way to help each other make our projects better than our last one. Mignon believes that highlighting projects in which members have been involved is an elegant way to market the professional expertise and capacity of OWA members. She would like to help promote fellow OWA members and recognize their contribution to the building industry by featuring their green projects in the GAB Report. If you are interested in having your project featured or writing an article (fellow member Carolyne Orazi has been writing from London), please contact Mignon O'Young. If you are on Facebook, please consider becoming a fan of the Green Architecture and Building Report at http://www.facebook.com/gabreport. Thank you. 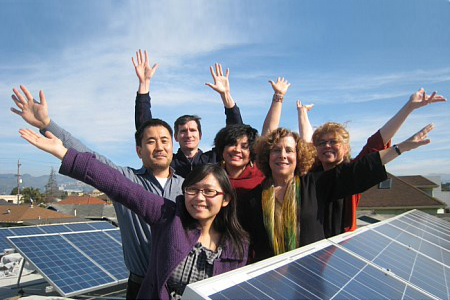 As environmental stewards, Golden Associates, Landscape Architects, are proud of their commitment to provide sustainable landscape solutions and were determined to go solar regardless of the generous federal and state assistance they received to install the 92 solar panels to power their 9,000 sf commercial building which houses their Urban Design Studio. This year only, the government is offering a huge depreciation opportunity for solar. HR 4853 allows a bonus depreciation of 100% of 2010 and 2011 solar installations. Golden Associates would like to thank Chase Representative George Nwakudu (510-914-1550) for providing loan assistance and Kevin Good (510-390-1876) of Sun's Free for the solar installation. 2011 has been quite a year for Topher Delaney. Topher Delaney is the recipient of the 2011 Distinguished Alumna Award for the University of California Berkeley representing the College of Environmental Design. This award acknowledges her contributions in the arts + philanthropy. In particular the Medicinal + Botanical gardens which are experienced in inner city public hospitals, hospitals which serve pediatric oncology, police stations within the urban matrixes, public botanical gardens, and public institutions of learning, and yes shopping centers!!! Topher Delaney is currently exhibiting in a solo exhibition at the Don Soker Contemporary Art . The gallery is a wonderful 5,000 square foot venue in which there are 50 pieces of her current works of art. If you are in the vicinity you will enjoy the installation of the little people / precious little consider the squirrel / pistols + stamen/ the guns of transformation / + 9’ high column of plush animals. Topher Delaney, in keeping with her philosophy of natural balance + health in the environment, has launched with a team of Jedi wizards www.GlutenFreeReviewer.com. Anyone with an allergy to food (in particular gluten) should check this terrific site out. Topher Delaney has also been teaching a series of courses @ The University of Berkeley + The San Francisco Botanical Garden entitled Mapping Sanctuaries, the intersection of geography with spiritual + cultural practices. June 24th celebrates the opening of SEAT @ Fort Mason Center, a National Park located on the shores of the San Francisco Bay, which is an exterior exhibition of 45 artists, architects, landscape architects, and engineers. This exhibition will be present for two years to accommodate the America’s Cup Race in San Francisco Bay. Topher Delaney is the curator of SEAT. This will be a prime spot for viewing the races!!!! As part of the University of Iceland’s 2011 Centennial Celebrations on March 22 and 23, Professor GALEN CRANZ spoke on “Body Conscious Design” at the Icelandic Association for the Study of Pain and on “Defining the Sustainable Park,” at the University of Iceland. Grand Miniatures: 19th Century Souvenir Buildings from the Collection of Ace Architects has opened in the International Terminal of the San Francisco Airport. The exhibition features a range of highly-crafted, European architectural miniatures, many made as souvenirs of the Grand Tour. The exhibition catalog is available for viewing online. This exhibition features original drawings that Maybeck created for his colleague Julia Morgan’s Western Hills cemetery project in Lawndale (now Colma). Although the cemetery was never built, the drawings themselves stand as a monument to Maybeck’s imagination and artistry. Included are these works from the private collection of Foster Goldstrom, as well as documents, photographs, and books from the GTU archives and other Bay Area collections. The exhibition is free of charge and open to the public during library hours. 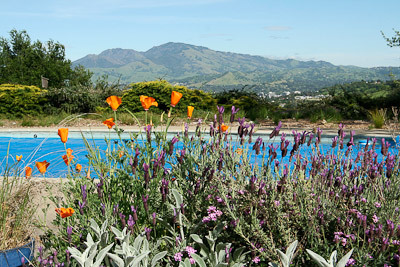 For further information, please call (510) 649-2500 or visit http://www.gtu.edu/library/news/art-exhibitions/. OWA Book Circles were formed to learn from the literature specifically linking women and architecture. This is a report from the March, 17, 2011 Book Circle meeting. We started our book circle with an open discussion about the author’s point of view on issues related to gender and social status influencing the use and designs of our built environment. Professor Weisman calls for much greater attention to the kind of spaces that are being built without fully thinking about the reality of women’s lives and lives that do not fit the nuclear family. She gives numerous examples of social changes in history, particularly with the home, and she describes environments where she sees patriarchal thinking as not always helpful to women or society. She calls for a renewed concern for the social issues that are part of programs, planning, and design. The following is a synopsis of our discussion. Wendy Bertrand: This book may not of had photographs of elegant elevations,but Weisman was mostly talking about plans and I thought the ones she did include illustrated her points. She showed two floors of the Neighborhood Women’s Inter-Generational Housing, Greenpoint, Brooklyn, New York by architects Katrin Adam with Barbara Marks. For example I liked the renovated 7th floor where the floor was divided into 4 apartments that were easily expanded from the central 2 family apartment where each family has own entry, bath and bedrooms but they share living room and kitchen and the one family apartments shared the same entrance at each end of the double apartment; in other words, lots of bedrooms with fewer kitchens, entries, and bathroom. Weisman was looking for examples that address the different living needs of women, often single women or groups she referred to as “mingles”. Designing for mingles (may be men or women) would be a workshop in itself. Another idea she mentioned which I had not come across was the idea that when a family divorces, the woman often gets the house but she has a hard time paying for it’s upkeep, and would like to divide the house in two, for more income, but often zoning doesn’t allow it. This impacts women more than men. The book reaches deeply and I started to read it a second time. Professor Weisman discussed women’s issues on many levels, at the same time the built world stays the same while women around the world generally are so vulnerable. We need to look after the ones that have less and bring forward these issues in our everyday life. As for the age of her ideas, yes the book was written almost 20 years ago, but the floor plans in our suburbs of today are not more socially reflective of changes specifically for women. For those who are floating along with the status quo this is a good wake up read. The childbirth environment was giving as being better now than described in the book. Inge mentioned that I had worked on this idea as a graduate student in the 1970s. At first I didn’t think much of that comment, but then I realized that in 40 years the change in the childbirth environment is an important example of a gender specific environment being impacted by the feminist movement. And to me that is Weisman’s whole call: environments need to be more socially aware of the users – including women with many social realities different from men’s. There seemed to be a feeling by some members in the book circle that money was calling the shots and social issues didn’t have much of a voice because social issues would not be profitable, but that is not for sure or a reason to not bring them forward. I think we still need to bring up women’s issues in the environment and try to add more variety and thoughtfulness and this book gives the talking points to do so. Or… become a developer or get real rich and lead the way to adding social issues to architectural programs and designs. Jamie Brown: This was a great source to read and a resource to find future readings from. This book was a good starting point for a discussion about social, spatial and gender status and its manifestation of social inequality. Tammy Lin: The book was a good catalyst, connecting social and spatial aspects of our profession. It is a great place to start thinking about spaces we inhabit. It allows us to think about and be prepared with solutions to respond to these design challenges. Shannon Devine: I like the depth of the author’s feminist analysis on the built environment. Although most thoughtful architects understand the concepts today, the author reinvigorates my commitment to inclusive design. She does this because of her historic references and attention to details. Inge Horton: This book was the last book that was written by the author. The book was mind opening. I haven’t thought about in detail of language and space the implications of our social structure. There were some fun parts to the book for instance the house that moves in and out with one’s mood at the last chapter. Leon Setti: Since the book was about design it didn’t have enough pictures. I felt some of the examples were a little outdated such as the example of the corporate office. In the book the author states that the male occupies the corner, well-lit offices while the women are all cramped in the center with no privacy and access to a view of any sort. If you look at offices today women and men are both under mistreatment by people who have more power. Hourig Ayanyan McCray: I enjoyed reading some parts of this book. I came to learn about the implications of race, gender, and social status. It was interesting to read about the historic evolution of these spaces such as the birthing centers as well as work, home, and public spaces that we inhabit. Although it might’ve been of great relevance during the time this book was published it came across a little outdated in my perspective.